Welcome to a stunning 4-bed home fit for a king, just off King’s Road. If you’re wanting to stay somewhere spacious and luxurious in central London, this 4-bed house with 2 bathrooms, office and outside space is as stylish as it gets. There are plenty of places to stay in London. But only a select few places that give you great memories that stay with you long after you get back home. 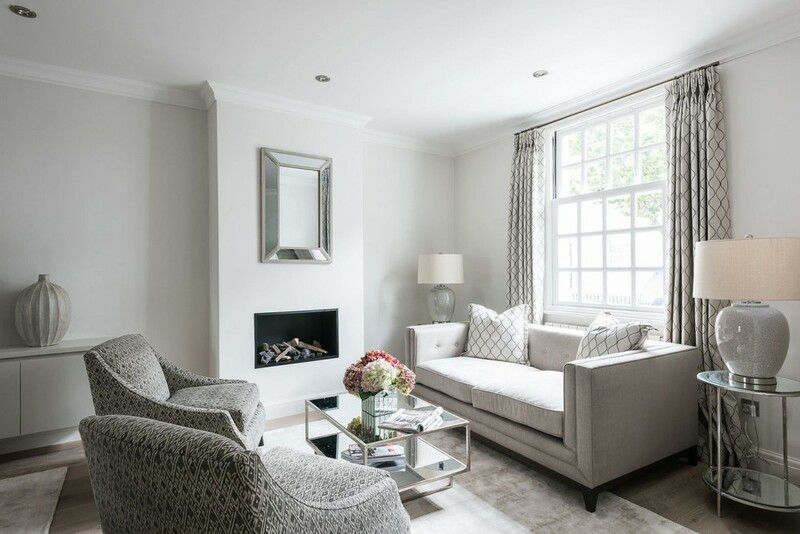 Being so close to King’s Road, Belgravia and Sloane Square, some of the most desirable addresses in London, you’d expect this house to be stunning. And it won’t let you down. As soon as you set eyes on its vibrant exterior, you’ll know that here’s a stand-out house in an outstanding location. The promise of luxury within is delivered as soon as you open the front door and enter the impressive double aspect living area. There are two sofas here, one a corner sofa from where you can watch the widescreen television. The other part of a three piece suite by the fireplace, an ideal area to reflect on the day’s events and plan what you’ll do tomorrow. There is an outside area with a table and four chairs, such a rarity in this area of London, where every inch of space is so coveted. Returning inside, the ground floor also features the first of the two single bedrooms. The carpeted staircase takes you down to a smart dining area. What’s the stand out feature here? Take your pick from the mirrored wall or the beautiful circular table that comfortably seats six. It leads through to the so-stunning and spacious kitchen. Everything here is high-end, from the integral appliances to the beautiful units, the flooring to the worktops. A big window lets light flood in, so if you’re planning to prepare a meal or two during your stay, it will be a real pleasure. There’s even a small table for two and a wall-mounted television to keep you entertained while you warm up some croissants for breakfast, or wait for the evening meal to finish cooking. Also on this floor, you’ll find a small office space with a desk and glass ceiling that gives the area a conservatory feel. And there’s a washroom with a toilet and sink and utility with washer and dryer. Onwards and upwards to the rest of the bedrooms. The master features an immaculately presented King Size bed, in a room with twin windows, a fitted wardrobe and a big en suite, featuring a double sink, toilet, bath tub and walk-in shower. The third bedroom features twin beds - ideal if you’re visiting with children, in a room with twin sash windows and spacious, fitted wardrobes. The fourth bedroom contains a small double bed, again in a room with a fitted wardrobe and single window. Finally, there’s a second bathroom to banish any morning queues, this one featuring a tub with shower over, as beautifully furnished as the rest of the property. The owners of this stunning residence are delighted to open their doors to discerning guests who appreciate stylish and luxurious living. Whether you’re a family or group of professional friends, the entire property, including outside space at the rear, will be exclusively yours for the duration of your stay. Please note that the house is accessed via several steps leading up from street level to the front door.